The Day Care Centre has over 200 children attending 5 days a week. 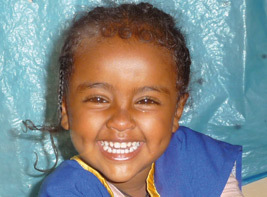 Ethiopiahope is sponsoring 32 of these children. For £75.00 per year a child receives education and a lunchtime meal with tea and biscuits morning and afternoon. We also supply medical support and clothing if required. Monday mornings it is apparent that some of the children have had very little to eat over the weekend as they waft down their tea and biscuits. The 8 teachers give the children great care and attention; the atmosphere is always bright and full of fun. We purchased some new toys this year, building blocks and balls. Added to this we took out some new teddies.